President • Huftalin, taking over Friday, aims to bring in more minority students, boost technology programs. Trent Nelson | The Salt Lake Tribune Dr. Deneece G. Huftalin is named the new President of Salt Lake Community College, Thursday September 11, 2014. Trent Nelson | The Salt Lake Tribune Dr. Deneece G. Huftalin speaks after being named the new President of Salt Lake Community College, Thursday September 11, 2014. 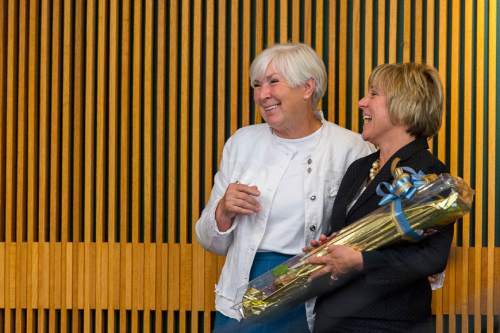 Trent Nelson | The Salt Lake Tribune Dr. Deneece G. Huftalin, right, embraces Gail Miller after being named the new President of Salt Lake Community College, Thursday September 11, 2014. 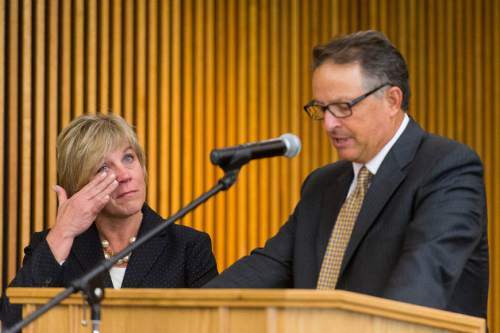 Trent Nelson | The Salt Lake Tribune Dr. Deneece G. Huftalin, left, wipes away a tear after being named the new President of Salt Lake Community College as she's introduced by Daniel Campbell, Chair of the Utah State Board of Regents, Thursday September 11, 2014. 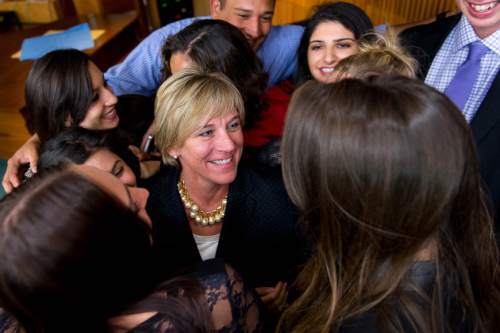 Trent Nelson | The Salt Lake Tribune Dr. Deneece G. Huftalin is embraced by members of the Salt Lake Community College student association after being named the new President of the college, Thursday September 11, 2014. Trent Nelson | The Salt Lake Tribune Dr. Deneece G. Huftalin, after being named the new President of Salt Lake Community College, Thursday September 11, 2014. Trent Nelson | The Salt Lake Tribune Salt Lake Community College Interim President Deneece Huftalin speaks at the school's Commencement at the Maverik Center in West Valley City, Thursday May 8, 2014. When Deneece Huftalin learned that brutal civil war in Sudan had separated one of her students from his mother for over two decades, she started searching for ways to help him reunite with his family. In the end, the college administrator arranged for Dut Bior to visit Kenya as the subject of a documentary. It&apos;s that kind of hands-on, creative problem-solving  applied to help a traumatized young man  that friends and family say shows Huftalin&apos;s commitment to student success. "She was interested to really see that dream for me become a reality," said Bior, who first met Huftalin at a leadership conference years ago. The gesture, he said, "was beautiful. She&apos;s a good leader who cares about her students." 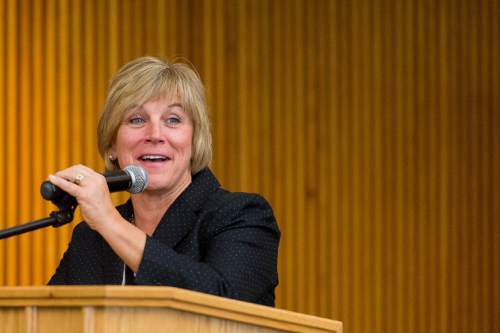 Now, after about a year as interim president of Salt Lake Community College, Huftalin on Friday will formally take the helm of Utah&apos;s largest two-year college. In a swearing-in ceremony scheduled for 10 a.m. at the Redwood Road campus, she will replace Cynthia Bioteau, who left to lead Florida State College in Jacksonville. 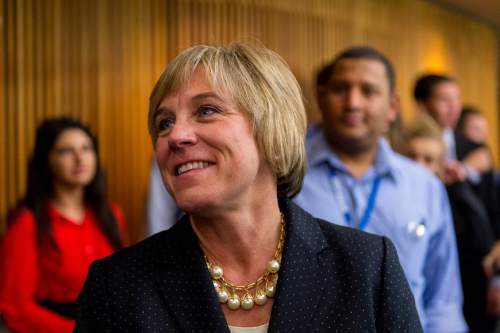 Bior and others who are close to the 52-year-old Utah native describe her as a skilled negotiator who works hard to show students they belong in college. 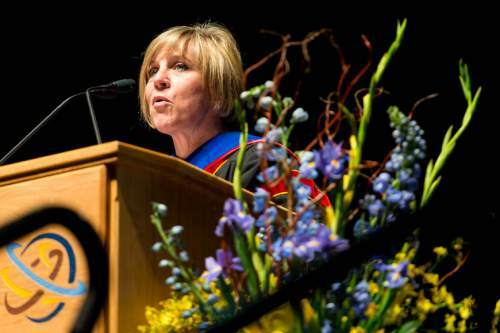 As incoming president of the community college, Huftalin says she has three main priorities: drawing more students from Utah&apos;s fast-growing Latino community, streamlining the path from SLCC to a four-year degree, and strengthening the school&apos;s technology-related programs. 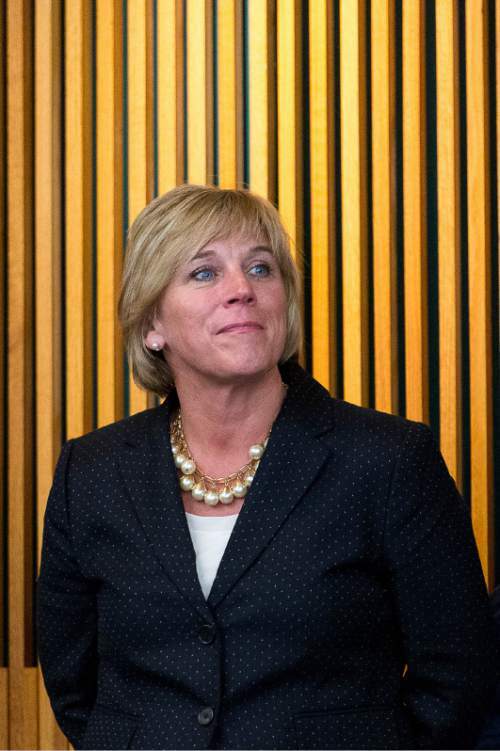 Huftalin believes her to-do list will help propel the state to meet Gov. Gary Herbert&apos;s goal of having two-thirds of state residents earning some kind of secondary degree by the year 2020. The nearly 30,000-student school, with its low tuition, flexible courses and open access, is the "workhorse" in meeting the governor&apos;s benchmark, Huftalin said. At SLCC, night and online classes are open to any Utah high school graduate. Tuition for an average course load costs about $1,700 a semester. Huftalin hopes to help those earning two-year degrees maximize their credits at four-year universities. This year, administrators at the community college and the University of Utah are hashing out the details on a dual-admission pilot program to send students to the U. after two years. "That&apos;s something we&apos;re hoping to enhance," she said. At the same time, Huftalin, like other higher education leaders across the state, is trying to better cater to first-generation students. On campuses in Salt Lake City and in Taylorsville, just shy of two in three SLCC students are the first in their families to attend college. "They don&apos;t have mom and dad to say, &apos;Here&apos;s how you fill out the [federal financial aid forms]. Here&apos;s how you apply&apos;," Huftalin said. And many of those students are Hispanic, she added. The most recent Census data shows that Salt Lake County is nearly 18 percent Hispanc. At SLCC, a smaller percentage of the student body  13.2 percent  are Hispanic. Huftalin wants to change that. "We have a gap there in terms of students and how they&apos;re accessing us," she said. To fill the gap, school leaders are developing a peer mentoring program, Una Mano Amiga, to recruit more Spanish-speaking students and keep them on track. Elsewhere, community college educators are aiming to prepare students for jobs at manufacturing and high-tech companies by teaching them to program computers and to collect and analyze data. Potential employers for SLCC graduates include Boeing, L3 and Hexcel. Huftalin is hoping for more classroom and work space to boost the program. "We see that as a real important part of our mission," Huftalin said. "Our No. 1 ask" from state legislators this year is a planned college building in a manufacturing corridor west of Salt Lake City&apos;s airport. Huftalin never had a degree from a community college, but she is passionate about what she calls their missions of diversity and open access. "When you&apos;ve got a 50-year-old businessman sitting next to a 19-year-old kid from high school in a business class, and they can talk about the real world versus the theoretical world," she said, "that&apos;s a pretty cool conversation." Huftalin grew up in East Millcreek. After graduating from the University of Utah with a bachelor&apos;s degree in organizational communication, she road-tripped to California with a friend and ended up taking a job in Stanford University&apos;s admissions office. "I was surrounded by students," she said. "I just loved that." She later earned a master&apos;s degree in higher education from the University of California Los Angeles, then managed dorm life at Chicago&apos;s Northwestern University before taking a job at Illinois&apos; Harper Community College in the early 1990s. At the time, people viewed community colleges as revolving doors, says Huftalin&apos;s boss and mentor at Harper, Joan Kindle. But Huftalin tried to steer students from the start, Kindle said, meeting with them one-on-one to review professors&apos; expectations and chart their semesters. "She&apos;s not a watch-looker," Kindle said. "She brings herself to the moment." Huftalin&apos;s husband, Tim, agrees. Interacting with students, he says, is what drives her. "They keep her motivated because they&apos;ve got all this great energy," he said. "She hates to not be in motion." In 1992, Huftalin returned to Utah, taking a job as director of academic and career advising at SLCC. The school was growing with a wave a federal grants to propel more low-income students toward graduation. "It was a nice opportunity for me to get in at that level and watch this place take off," she said. The college stuck. Huftalin has stayed for more than 20 years, working her way up. She returned to the U. and earned a doctorate in education leadership. Outside of work, Huftalin gathers with her husband Tim and sons, ages 16 and 20, to hike, ski or watch movies including "Finding Nemo" and "Love Actually." Both Huftalin&apos;s husband and her friend expect her to continue her life&apos;s avocation in her new post at the college  building up students and sending them out into the world. "She helps people see the light in life, see the pathway and do more than they think they can do," Kindle said. "That&apos;s why she&apos;s a great leader."